Current markings of places are shown near the places. The number of tokens on a place is shown in a green circle. A green status bubble will also appear when a simulation stops. A speech bubble will show the reason why the simulation stopped. Sometimes the simulation feedback covers parts of the net, making it hard to read. Therefore, it is possible to move the current marking information around by dragging it to a new position. Dragging the green circle will also move the green box with token values, but dragging the box will move the box independently from the circle. The positions of current marking information are saved when you save a model. 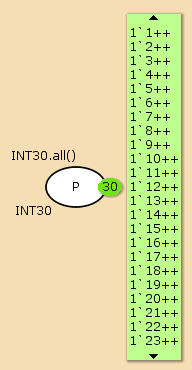 The token values can also be hidden. Click on a green circle to hide/show the corresponding token values. 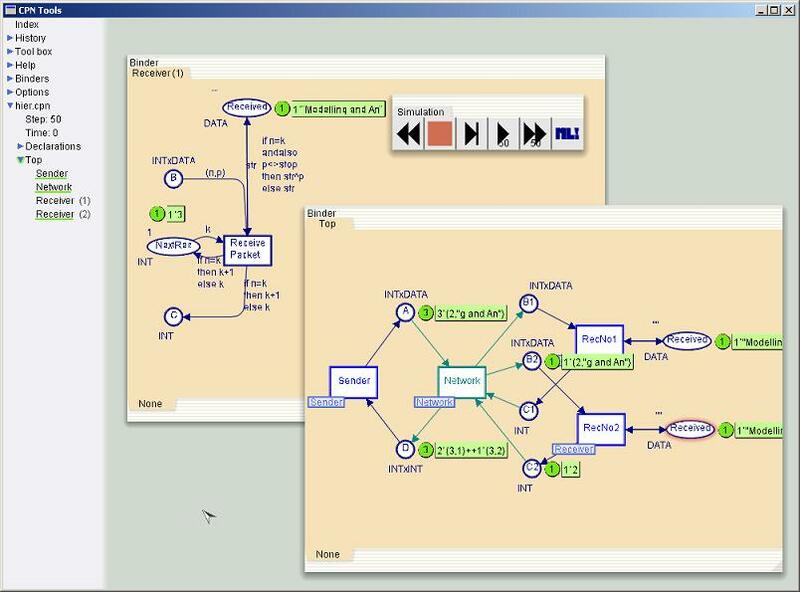 Simulation feedback is not updated during a fast forward simulation, but it is updated after the simulation has completed. After applying the fast forward tool, a light purple status bubble will indicate that a time-consuming operation, i.e., a long simulation, is currently being executed. The green boxes with token values will show one token value per line when the token values are relatively short. When the length of a token value is long, i.e. it exceeds a predefined width, then the token value will be wrapped and shown on two or more lines. If the green box with token values is more than ca. 20 lines long, then only ca. 20 lines will be shown at one time, and two black arrowheads for scrolling will be added to the top and bottom of the green box. Click on an arrowhead to scroll in the token value text. 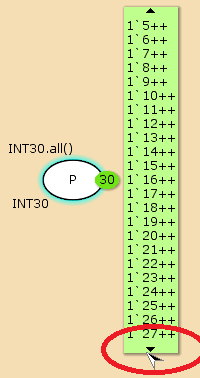 If the green box has arrowheads for scrolling, then all token values can be viewed by entering text-edit mode in the green box.